There’s just something about the marriage of two great cuisines that makes for great food and I think that Banh Mi Sandwiches are one of the finest examples. I had the good fortune to live in Los Angeles during the time when Wolfgang Puck and California Pizza Kitchen were making wild pizzas and Puck opened a marvelous fusion restaurant named Chinois on Main where the mini crème brûlèes served on the lazy susan were flavored with all sorts of Asian flavors and were small enough that you could try them all. Ever since that time I’ve been a fan of exploring the possibilities of taking the best ingredients and techniques of cuisines that seem worlds apart but when brought together make unique and amazing new dishes. I can’t recall exactly when I had my first Banh Mi Sandwich but I was obviously hopelessly hooked on them because if a sandwich shop or kiosk has them on the menu I’m in! BTW this also goes for crab cakes, moules frites, sweetbreads (not the pastry) and phad thai! So let’s start with the quick pickle. 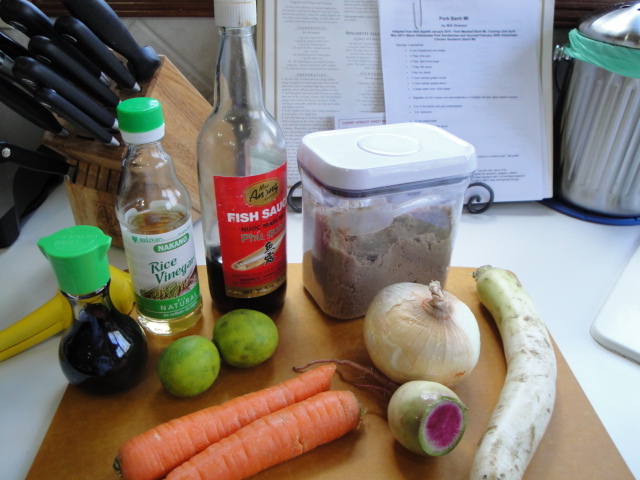 Like I said the essential ingredient is fish sauce, then you need a bit of sweet (I like light brown sugar), some acid (unseasoned rice vinegar and/ or lime juice) and a bit of soy sauce for salt and flavor. Next comes something to pickle. When I get daikon in my CSA bag I know there is a Banh Mi sandwich in my future. 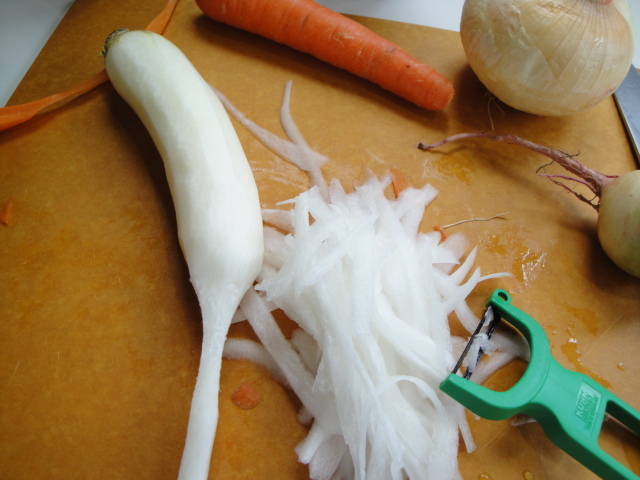 If you’re not familiar with daikon, it’s that long white root on the right in the photo below. It has a mild radish flavor and is great eaten raw or roasted. 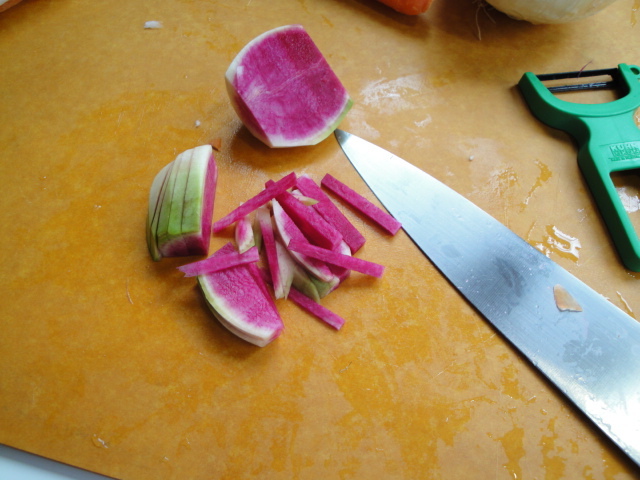 The round root vegetable with the bright pink interior next to it is a watermelon radish which is also in the daikon family. They both add great flavor and texture to the pickle. 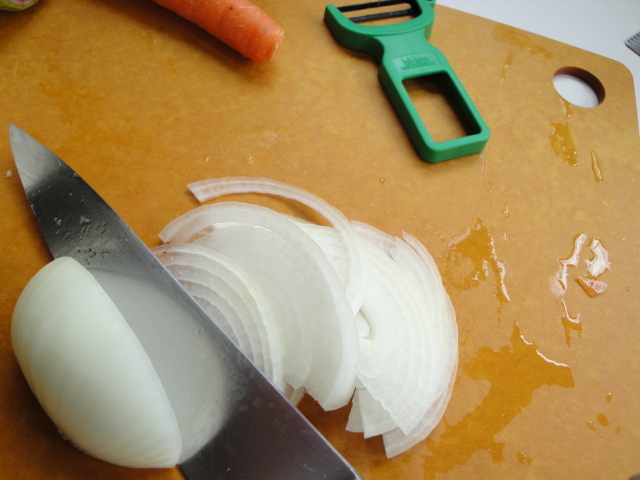 Carrot and sweet onion round out the pickle ingredients today, but feel free to experiment! 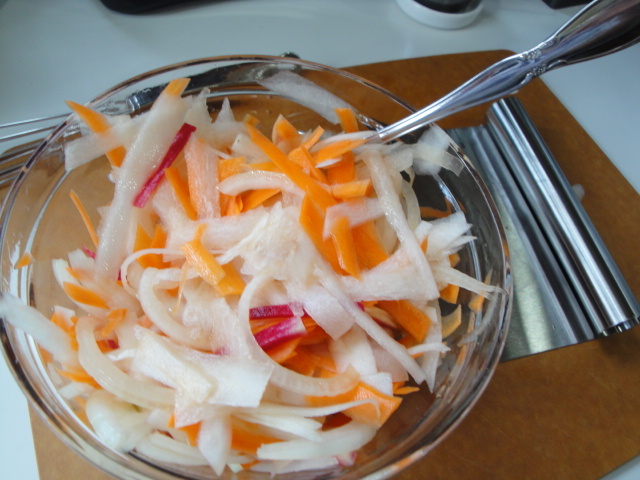 Stir the veggies into the brine and set it aside while you go to work on the rest of the sandwich. Now for the meat of the matter. 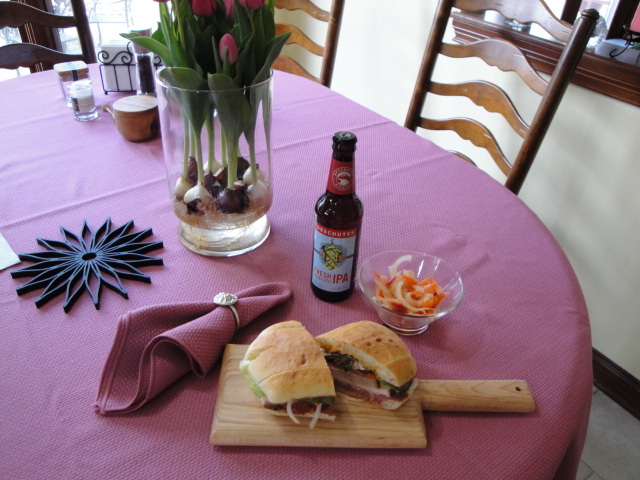 I’ve been dreaming of this sandwich for a while, so I had the liverwurst on hand. For me this is where the marriage of French and Vietnamese flavors shine. The richness of the “pâté” against the sweet vinegary bite of the pickle and the crusty bread is a food marriage made in heaven. The roast pork (more on this later) brings more substance and flavor to each bite. If you’re not a pork person some chopped chicken liver with some roasted or grilled chicken would be awesome and I’m thinking that for my vegetarian friends, some mashed avocado and some sauteéd tofu or grilled tuna could be mighty fine as well. The pork loin I’m using is leftover from the roasted bone-in pork loin with roasted winter vegetables I made this weekend. It is a seriously (pun intended) a great recipe, starting with excellent pork from BluesCreek Farms and a reverse sear method of cooking. Now we’re almost ready to build this sandwich. 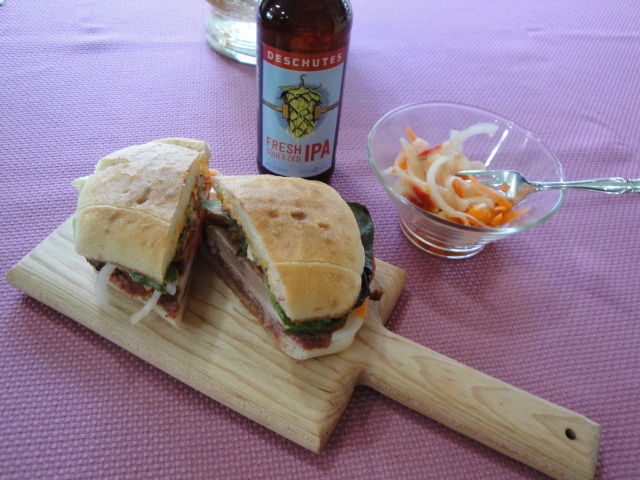 Today I’m also switching out the customary baguette for a different style sandwich bread that I’ve recently discovered. 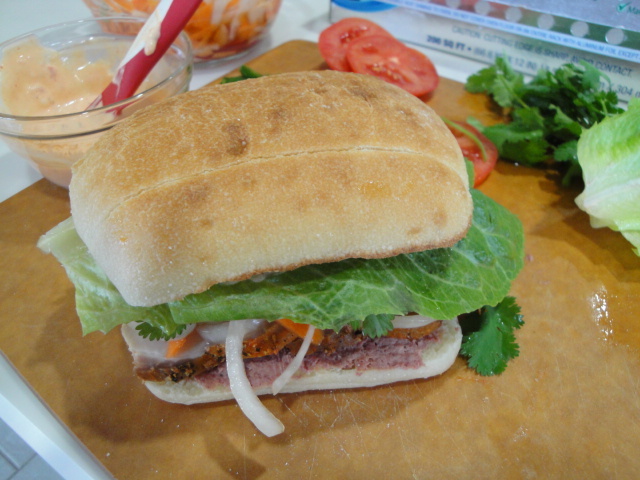 It’s a Torta sandwich roll from La Brea Bakery in LA and sold at Costco. So, in comes bread from yet another culture. I’ve also seen it in store bakeries labeled bolillo. 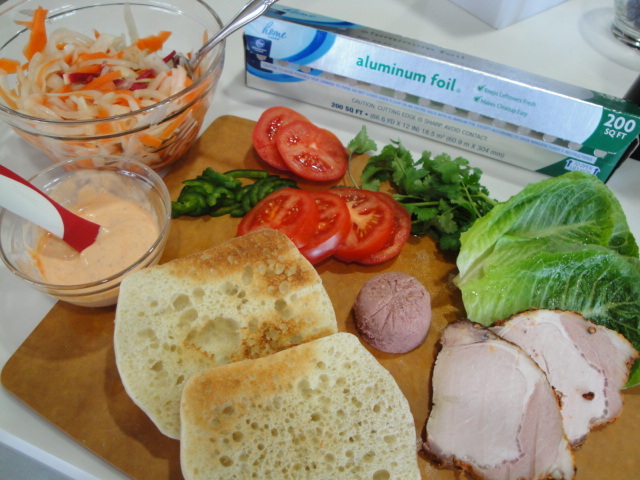 It works well for this sandwich because like its French cousin, it has a crispy exterior and a soft interior for soaking up all the juices and flavors in the sandwich. A ciabatta would work beautifully also. 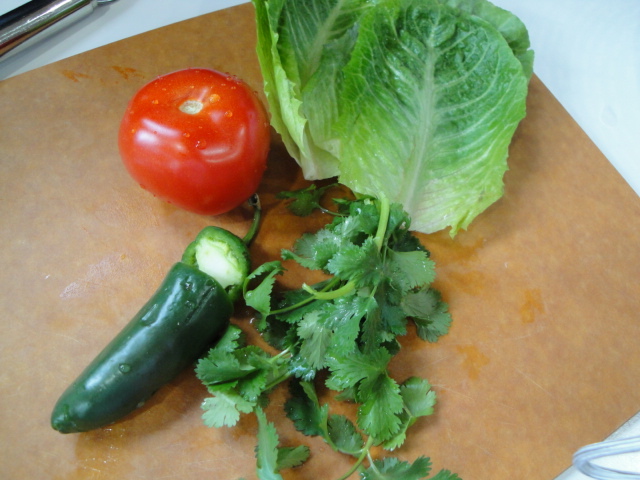 In addition to the pickled veggies in the sandwich I’m going to include some slices of tomato, romaine lettuce leaves, thinly sliced jalapeno and cilantro sprigs. 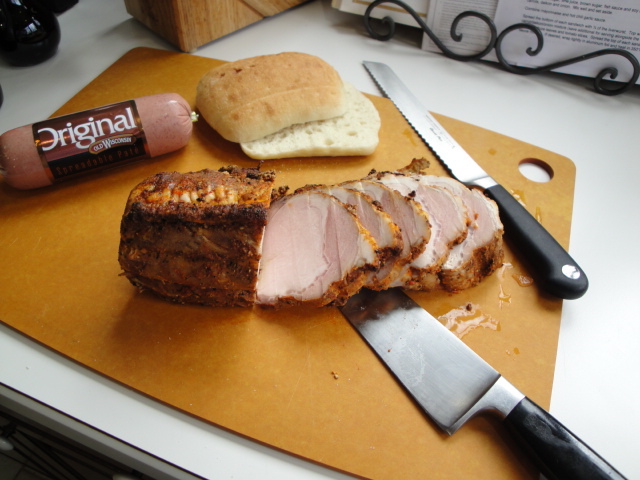 Start by spreading a thin layer of the liver sausage on the bottom slice of toasted roll, add a couple of thin slices of roast pork. 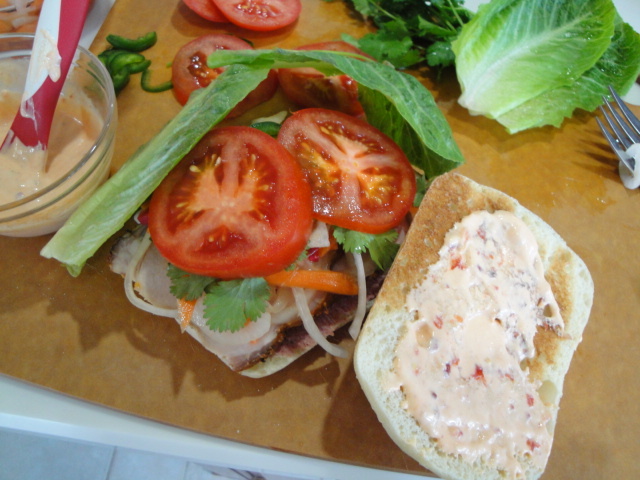 Top with some of the pickled veggies, thinly sliced jalapeno, cilantro, tomato and lettuce. Spread the top half of the roll with the spicy mayo and press down firmly! You can eat it as is, but I prefer to wrap it tightly in foil and heat in a 350° F oven for 10 minutes or so until it’s heated through. Now all you need is a cold one and then a nap! 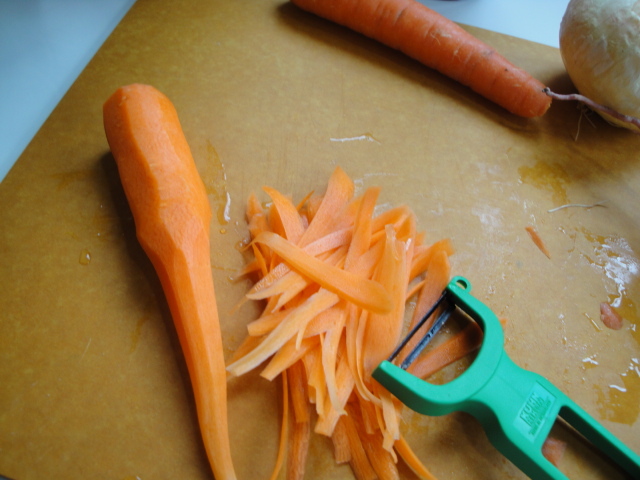 I like to serve it with some of the pickled veggies on the side and of course it tastes so much better if it’s served on a hand-crafted cutting board (thank you Katy). 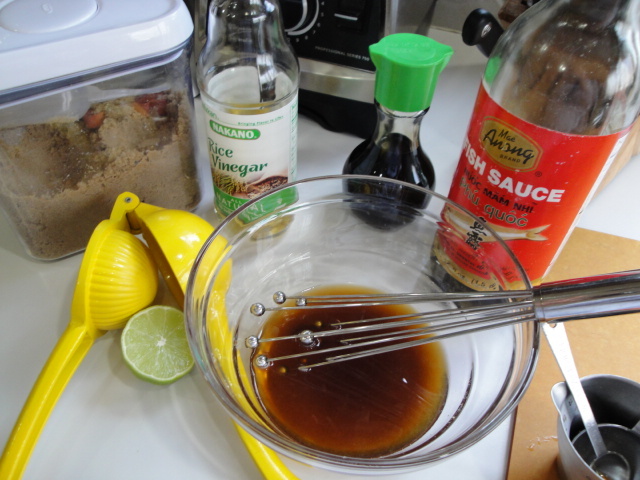 Whisk rice vinegar, lime juice, brown sugar, fish sauce and soy sauce in a medium bowl. 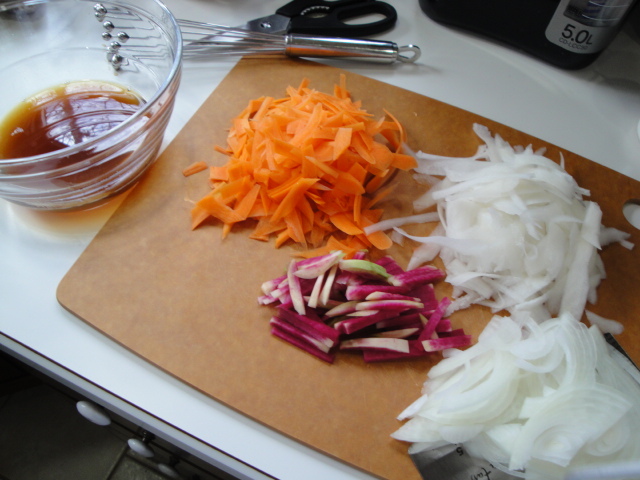 Add grated carrots, daikon, radish and onion. Mix well and set aside. 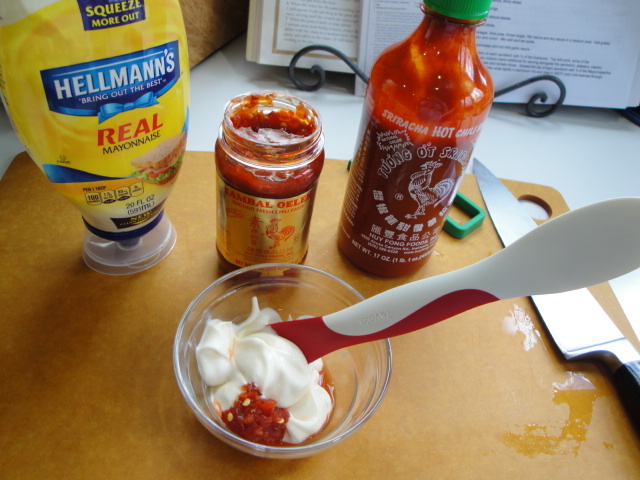 Combine mayonnaise and hot chili garlic sauce. 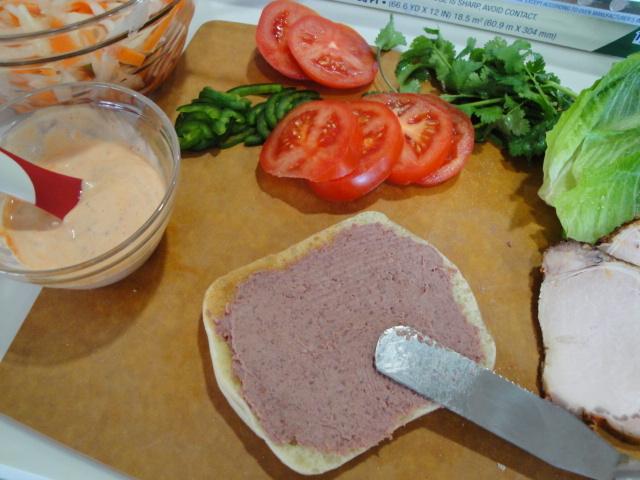 Spread the bottom of each sandwich with a thin layer of the liverwurst. 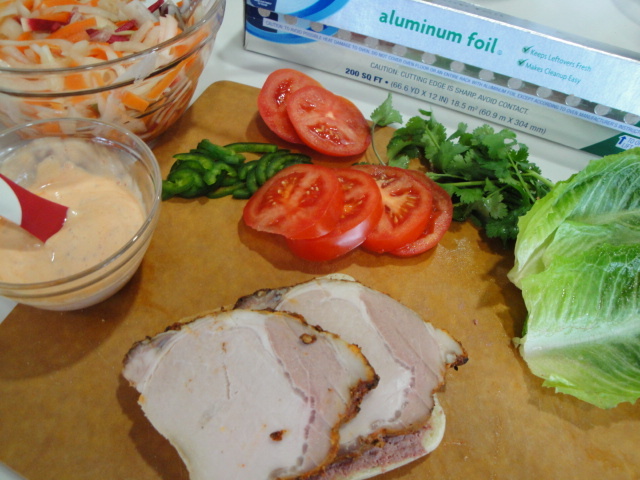 Top with pork, some of the carrot/radish/onion mixture (save additional for serving alongside the sandwich), jalapeno, cilantro sprigs, lettuce leaves and tomato slices. 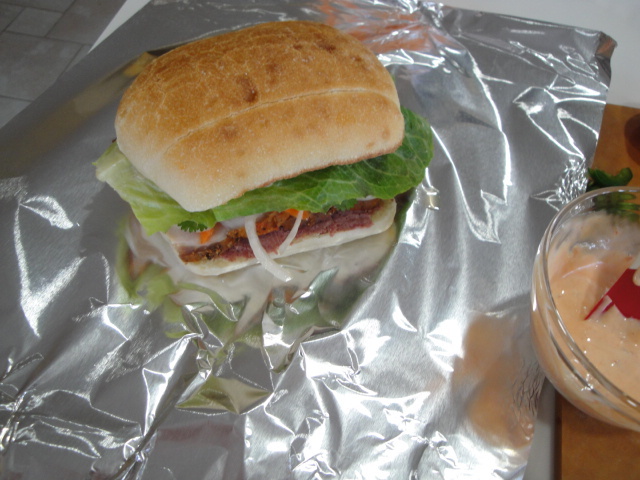 Spread the top of each sandwich with some of the mayonnaise/hot sauce mixture. 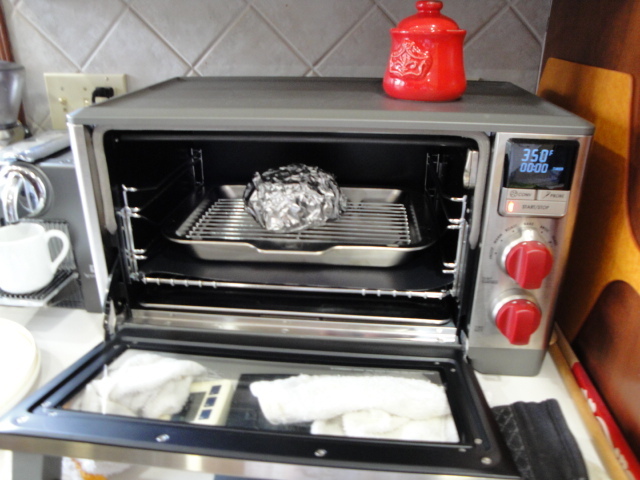 If desired, wrap tightly in aluminum foil and heat in 350°F oven until warmed through.